If you're new to carrying your gun, then finding the right concealment holster may seem like an insurmountable task. It doesn't have to be-forget shoulder holsters. 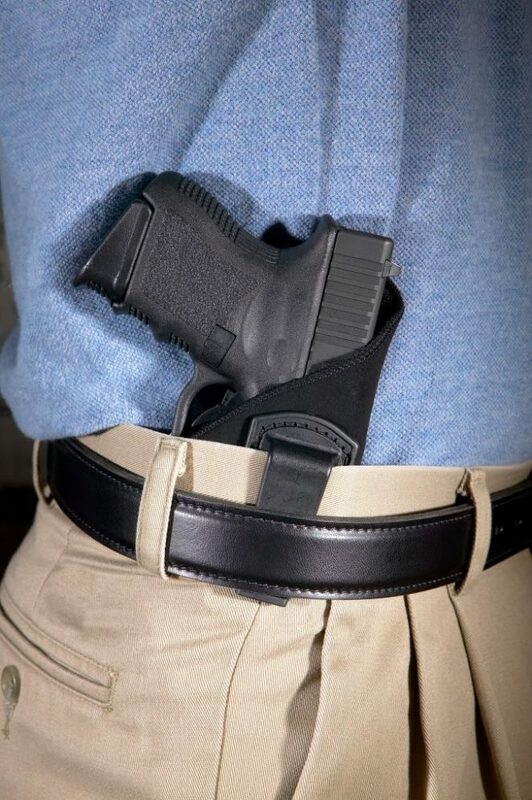 IWB (inside the waistband) carry holsters are the only type you need to consider. Besides for security, there are other aspects to consider when making your decision. IWB holsters are better for concealment than other styles. But for some, they can get too tight and uncomfortable, and also stretch out your pants. Check out our recommendations for the five most comfortable holsters for IWB carry below, and find the comfort and concealment you are looking for. This special heavy-duty plastic comes combined with other materials on many holsters. Others make holsters of kydex in entirety. 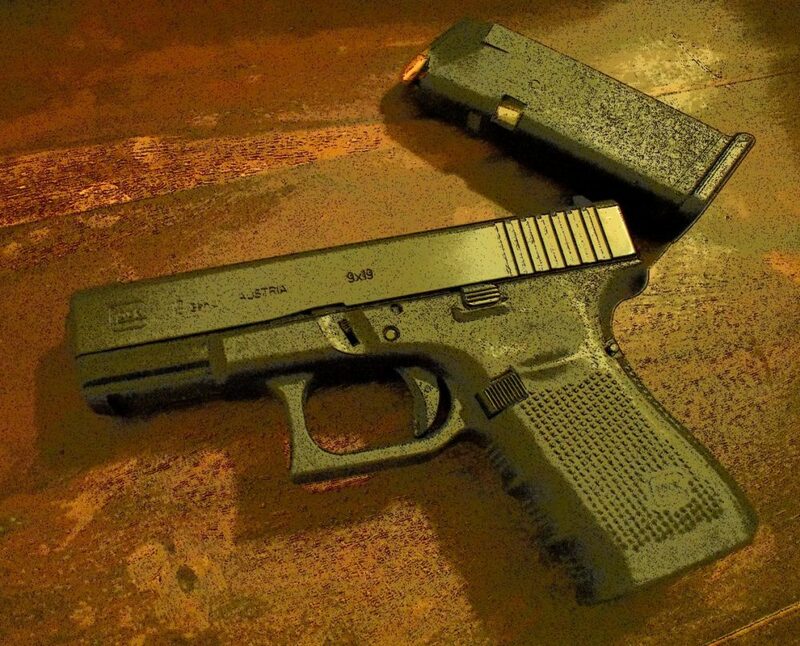 kydex holsters must have specific shape to fit your handgun because the plastic does not give. However, this means the holster will help keep your gun in place. 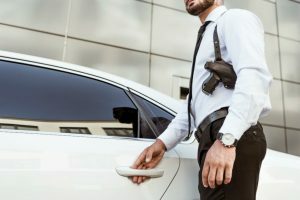 Security is one of the most important features of a holster. No one stands in one place while they are carrying. 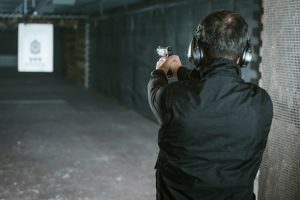 For this reason, a holster must be able to prevent the gun from falling out, while still enabling the person carrying to remove the gun if needed. Look for a holster that has adjustable force. Most often these models tighten with Allen wrench, so you can change the tightness and prevent the weapon from falling out. Try holsters from Concealment Express. They are a veteran-owned company, so they have experience in the field with security and comfort. These holsters are compact, and they have the rigidity of the Kydex material. Suede is a softer leather, like the Galco Stow-n-Go holster. This holster gives access and the ability to put the gun back in the holster with one hand. Suede holsters offer the quality you get with leather, but they are more pliable. They'll fit nicer inside your waistband and give you a little more leeway. Suede holsters are thin, so you can conceal them with little effort. Suede is also less slippery than the other plastic materials. This means the holster stays in place better . 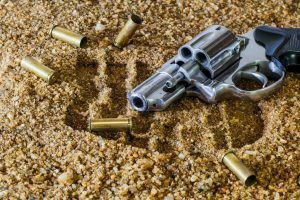 While a plastic holster might slip against the pants and rub in an uncomfortable manner, suede won't slide around. Holsters made of nylon can also vie for most comfortable. An alternative to the tough plastic of kydex, nylon holsters can take the same amount of rough wear. If you choose to carry in a more unusual place like an appendix carry, the nylon Blackhawk Ambidextrous Reversible holster is perfect. You can wear it anywhere in the waistband, and it fits many different handguns. Try this out before you buy a specific holster for your model. Nylon is a bit heftier than Kydex, so prepare for a little more bulk. But it's also sturdier (albeit sometimes brittle and susceptible for cracking). A stealth carry holster may be the best option for you when concealment is key. 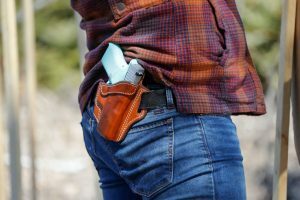 It's always important to keep your gun hidden when carrying concealed, but sometimes a minimalist holster does this best, depending on your choice of clothing. What some refer to as "Mexican carry" is carrying without a holster. 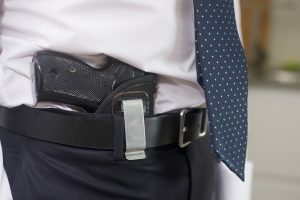 In this method, gun wielders hold their gun in place with only the waistband of their pants. 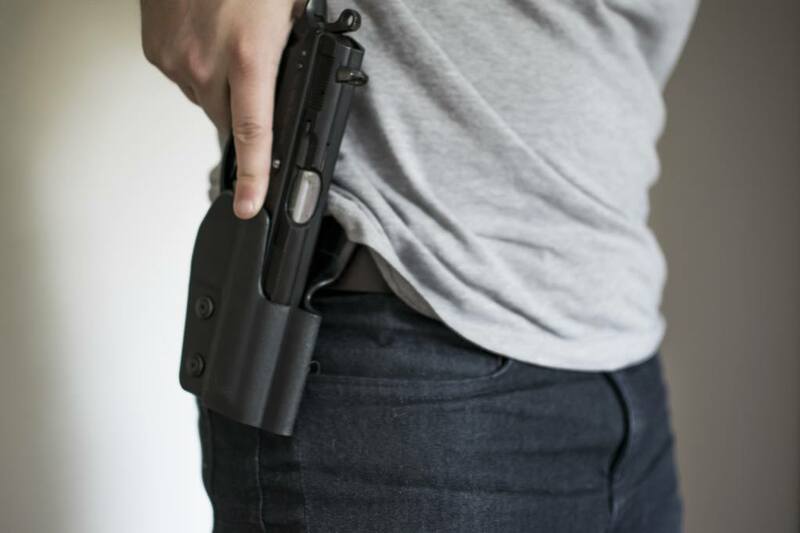 Carrying without a holster is dangerous with today's modern weapons. It was fine for gunslingers in the old west and their six-shooters. 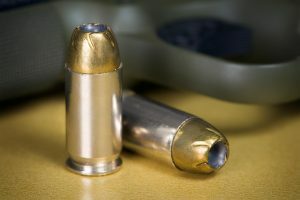 But a misfire is a better possibility with a 9mm than a single action revolver. The only exception may be the H&K P7 with the grip safety. This type of carry is most lightweight and also rates high for comfort level, which is why it's so appealing. A stealth carry holster mimics this type of carry while maintaining a more secure hold. That way you get the best of both worlds: comfort and minimalism. The Q-Series IWB Minimalist Stealth Holster only covers the trigger guard, so it has that barely-there feeling. It's also very lightweight. The holster comes in options for many pistol models, and the loop fits a belt up to 2 inches. A loop is a good alternative to a clip if you worry about the plastic clip breaking or a metal clip damaging your waistband. Some even argue that a clip is not secure enough and may get detached in a struggle. You're sure to find the most comfort when you carry inside the waistband, no matter how stealthy you feel you need to be. The best holster for comfort is a leather one. These holsters are durable and they form to the gun. This is because when you get a new leather holster, you stretch it out and break in the leather. Leather is perfect for the exact fit you need, and gets you through many years of daily wear, even with a coarse texture on the grip like the Springfield Armory XD. Most leather holsters include directions to break the holster in. If you're didn't come with any, try these tips here. 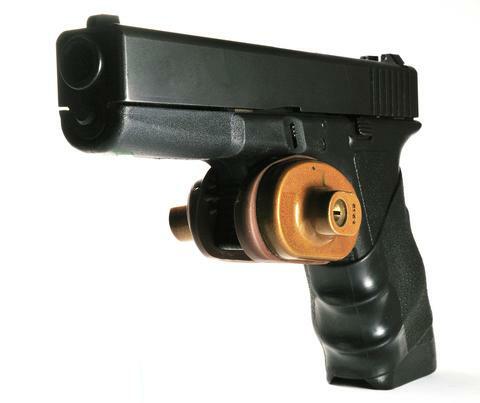 As with any holster, some cannot fir pistol accessory like laser housing. Be sure to take this into account when purchasing the holster that is right for you. For the most comfortable way to carry, try carrying inside the waistband. It doesn't matter whether you use a holster made of kydex, suede, nylon, leather, or something minimalist. You'll find carrying this way great for security, concealment, and comfort. Do not forget to check out our top 3 picks for the comfortable IWB holsters you can buy.